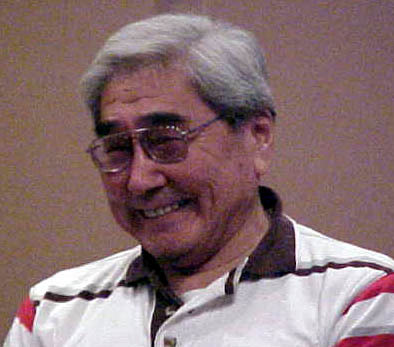 Angayuqaq Oscar Kawagley was born at Mamterilleq (now known as Bethel, Alaska). His parents died when he was two years old and so was raised by a grandmother. Yupiaq was his first language as his grandmother could not speak English. During his grandmother's early childhood, her parents would not allow her to go to school, saying that she would become dumb. The grandson caught the tail-end of the upper stone age from which his grandmother and Yupiaq people emerged from into the modern age. His grandmother encouraged his obtaining education. Coming from a harmonious world, he feels this prepared him well to try to fit into two worlds. He is now researching and trying to find ways in which his Yupiaq people's language and culture are used in the classroom to meld the modern to the Yupiaq thought world. Dr. Kawagley serves as Associate Professor of Education at the University of Alaska Fairbanks College of Liberal Arts. He has a Bachelors of Education with a major in Biological Sciences; a Masters of Education, Ed. Sp. in Administration from the University of Alaska Fairbanks and a Ph.D. from the University of British Columbia. He has been executive director of several nonprofit corporations; President of ESCA Corporation, an earth science and remote sensing consulting company; President of Calista Corporation, a native regional corporation; project director of the Indian Education Act Program, Anchorage Borough School District; school teacher; research assistant, Mental Health Unit, Alaska Native Medical Center; and research assistant, Chemistry and Biology Department, Arctic Health Research Center.